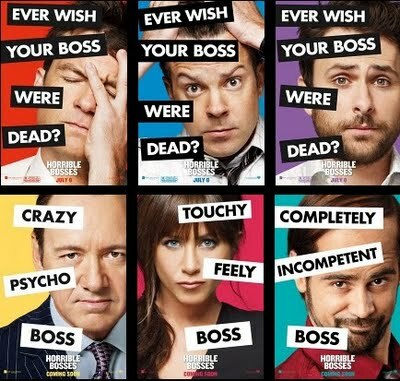 Feel like your 9-5 is a scene out of Horrible Bosses? Before considering “OTBD: Operation Take Boss Down,” try out these tips to improve your supervisor relationship and reduce your stress. Don’t be afraid of your boss. As intimidating as your boss may be, you both want to succeed. You’re on the same team so you might as well work together. Break important news fast. Whether you got a doctor’s appointment or a cousin’s wedding back at home, inform your boss asap. It won’t help your relationship with your supervisor if you’re peacing out three hours early to get your teeth cleaned. Be positive. As Thumper once said, “If you can’t say anything nice, don’t say anything at all.” Work is not high school (or college) so stay clear of office gossip. Embrace your strengths. Your boss chose you! Find tasks that take advantage of your talents. Face your shortcomings. There’s always room to grow. Ask your supervisor for advice and take advantage of training courses to improve your skills. Do your best. Enough said. We’ve said it before and we’ll say it again: Constant stress puts your health at risk. Visit mayoclinic.com for the complete list of tips. Sometimes the situation is just out of your control and you’re doing the best you can to make a positive out of a negative. A few months ago, a friend shared with me her de-stress technique for work. To deal with their horrible boss, my friend and her co-workers do breathing exercises right at their desk. Download Silva Relax for your iPhone (it’s free!). Breathe in, breathe out, work it out. These are good points. As a business owner, I would like employees who embraced these tips. Thanks for reading my massage post, and for leading me here! Today of all days I needed to read this post of yours. Great tips. Thanks! Thank you! At least it’s almost the weekend! Excellent advice! And perfect stress relief… at work or anywhere! In my stress program, breath work is one of the first things that I teach. There are many phone apps. Good share! Thanks! What are some other phone apps for stress relief? Like it, made me smile :D. Smiling is also good in order to get rid stress. Such a cool blog you have. It seems that when we’re unhappy with our current work condition, we want to blame someone else. While there might be factors working against us at work, the simplest thing we can do is change our attitude. We never know how much that alone might improve life at work. Thanks for the post. Some great advice and thoughts going on here. Thanks for the tips!